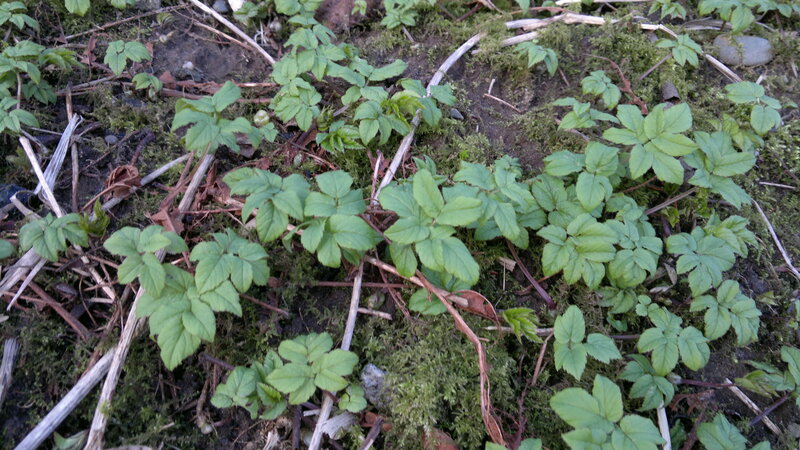 Ground elder – Identification, distribution, edibility. Identification -3/5 – quite distinctive, but as a member of the carrot/apiaceae family it has toxic relatives, so take care to properly tune into it. See here for more information: Know Your Carrots! Season – All year, best January – June, though its possible to find young shoots at most times of year. Habitat – woodlands, hedgerows, gardens, graveyards – generally close to human habitation. This is one of the safest of the carrot family to identify, and certainly the most common. Its serrated leaves are oval with a point and always grow in 3 groups of 3 from a grooved stalk, close to the ground, before sending up their flowering stems. Umbels of small white flowers appear in late May or June. It has a mild, lemon/parsley-like flavour, making it a natural partner for fish, and is good as a pot herb or salad ingredient. Don’t let anyone tell you its just a nasty weed! That said, you should certainly familiarise yourself with its poisonous cousins before picking. See also this page: Know Your Carrots! Probably due to its liking for graveyards, or possibly its historic use by monks, ground elder is also commonly known as bishop’s weed. It has close carrot family relations throughout the world, including ajwain which is widely used in Indian cooking. This sometimes also goes by the name of bishop’s weed, though it is a different species – trachyspernum ammi. The spice itself comes from the seed pods. Ground elder seeds can be used in similar ways, though are not so pungent. Read more about our native spice rack here. 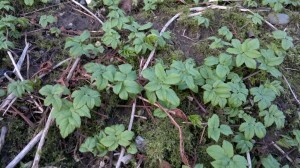 Ground elder is best eaten between February and June when it flowers. After this the taste becomes less pleasant and can have a mild laxative effect if you eat lots of it! If you are husbanding a patch (as opposed to trying to destroy like most gardeners! ), nipping off the flower heads keeps them tasty for longer. Although the seeds of Ground Elder are remarkably like those of Ajwain, they are nowhere as flavoursome. Can the flavour be enhanced by, say, toasting, or other treatment? I’m still experimenting with seeds/spices and completely agree with you. Somebody has told me that lovage seeds a more similar in flavour and I have been playing with some scots lovage seeds which are good. I also recommend wild carrot, hogweed, alexander and sweet cicely seeds among the apiaceae as excellent wild spices. Roasting, drying, pickling, lacto-fermenting and freezing are all treatments that can preserve/enhance flavours, but i’m not really in a position yet to give you any definitive advice on what works for what. I have a lifetime of experimenting to do! I’m hoping to write a blog soon on my discoveries to date. Please do let me know if you come across any treatments/uses for wild seeds that are exciting. I have loads of ground elder in my garden and have spent years trying to get ride of it , however i now discover you can eat it raw, but can you cook it and if so how? Yes, just treat it like (flavoursome) spinach – steam or sauté in a little butter. raw . As far as I know , it was introduced by the Romans as a pot herb . Can anybody suggest a sensible area in sq meters to “cultivate” ground elder to provide for a household of 2 + regular visitors…..and how will it perform in shade? Loves shade, and pretty much anywhere really. I’ve never heard of anyone cultivating it before – it doesn’t need any encouragement and is never far away.